“When my now adult son was a teenager, he was very frustrated and angry. He was often verbally abusive, overcritical, sarcastic and swore a lot. I didn’t feel comfortable with this behaviour at all, and it often triggered many unhelpful feelings, thoughts and behaviours in me. While I would sometimes react with a lot of understanding I overstepped my own boundaries. Sometimes I was snappy and critical. And other times I was emotionally unavailable, in fact I reacted by ignoring him, or rolling my eyes. These were all flag ups that I felt overwhelmed. A particularly Bleak Scenario started with a single thought that I was a failure as a mum, which led to an unhelpful fantasy about awful consequences for my son because of my behaviour. I poured all my Imaginational OE in the Bleak Scenario and it felt real because I also have Emotional OE. Every time we are aware that we are our ‘current self’, whilst envisioning our personality ideal ‘ideal self’ we experience the Gap Energy that we are not living up to. 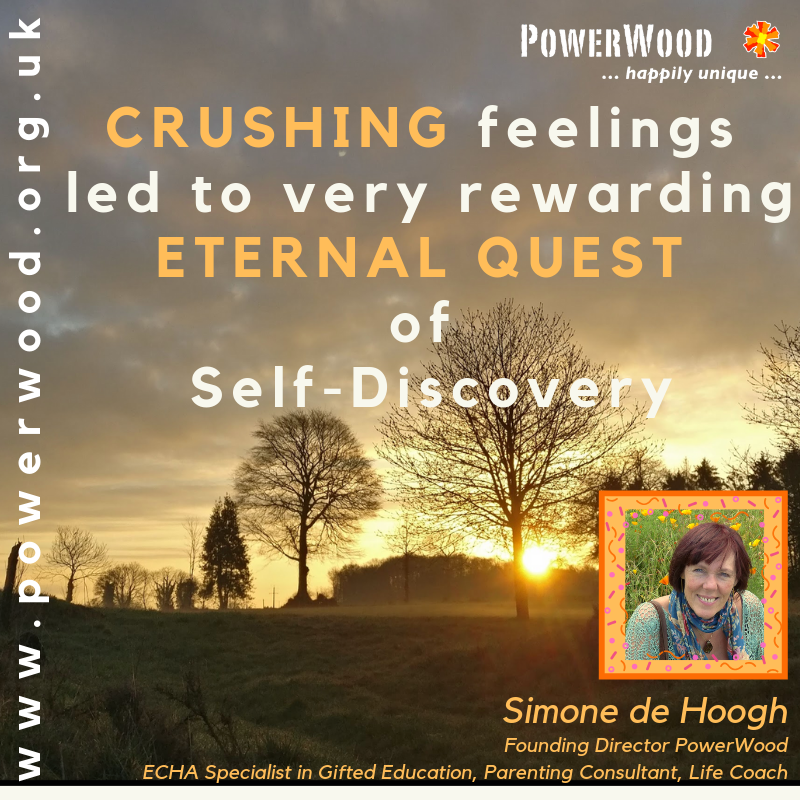 It can create a lot of negative feelings, thoughts and behaviour (what we call ‘unhelpful feelings, thoughts of behaviour’ to prevent negative suggestion) about ourselves and others. If we were not aware of this personality ideal we would have no drive whatsoever to learn and grow and we would never read this page. We would be content with the way we are, the way we behave and interact with others. The Gap-energy energy is a gift to us. We can use the energy either to pull ourselves down or lift ourselves up. When we pull down, we drain our energy further by creating an unhelpful train of thought, feelings or actions that ingrain unhelpful neurological pathways even further. Often entering a thinking path that triggers the familiar recurring unhelpful Bleak Scenario. When we grow, we use the energy for a tiny, tiny step towards our personality ideal, acknowledging that when we move up towards our personality ideal, our ideal personality will move up too. We will never get there, it is all about our journey. It doesn’t matter what we are feeling, thinking or behaving. It is all about raising awareness in a non-judgemental way and asking ourselves are these feelings, thoughts, or behaviours helpful. Do they contribute to achieving the strategic goals that we had set out when we were outside of this overwhelming situation, outside the Cycle of Emotional and Sensory Overload? The more we become aware of when we pull ourselves down the more we can grow. When we pull ourselves down, it is a flag-up that we do not have the energy to make even a tiny change, and instead have to focus on our Baseline. We can also focus on all the moments that we did stay calm, and we did manage to use our Gap-Energy to make a tiny step towards our personality ideal. One of the main issues with awareness is that as we become more aware of our behaviours, thoughts, feelings that we can have overwhelming reflections on ourselves and others that are mostly negative, e.g. guilt, shame, anger, resentment, self-doubt, self-pity, inner conflict, sometimes even self-loathing etc. Having these unhelpful thoughts about ourselves or others is often the start of a hugely elaborate, bleak scenario, that often has been visited many many times before, as described in Sandra’s story at the start of this blog piece: Overwhelmed by Guilt and Shame while Parenting? Congrats! Let’s focus on growing awareness, staying present for as long as we manage with our uncomfortable feelings, and embracing our personal growth path.